Sieve together the flour, baking powder and sugar. Whisk together the oil, milk, eggs and vanilla essence. Combine the two by forming a well in the flour mixture then pouring the milk mixture into the middle. Stir the two together until a soft dough is formed. Roll out the dough to 2cm diameter and then refrigerate on a lined baking tray, making sure that the pieces of dough do not touch and stick together. Mix the sugar and cinnamon together until evenly dispersed. Place all the ingredients in a mixing bowl and place over a pan of barely simmering water (a Bain Marie). Stir continuously until the chocolate has just melted and all the ingredients are fully emulsified (make sure you don’t heat mixture too much as otherwise the chocolate and butter will split and ruin your sauce). Remember both will melt at body temperature so once the chocolate begins to melt, use residual heat to finish off the sauce. Re-roll the doughnuts into round balls and deep fry these until golden brown, then drain and roll in the cinnamon sugar. Carefully heat the chocolate sauce in a heavy-bottomed pan then pour into an attractive serving bowl. 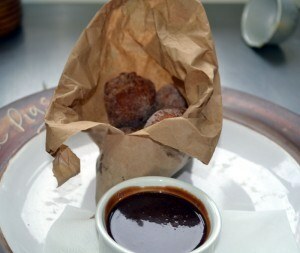 Place the doughnuts into a brown paper bag. Place a napkin on to a wooden chopping board then add the bowl of sauce and the bag of doughnuts. Serve while still hot and enjoy!